Doncaster Rovers interim manager Rob Jones says he is "loving the job" and will do everything possible to remain in charge of the League One club. Jones, 35, took temporary charge of the team after former boss Paul Dickov was sacked earlier this month. The club have advertised the position of first-team manager on their website and have set a deadline of 17:00 BST on Friday, 25 September for applications. 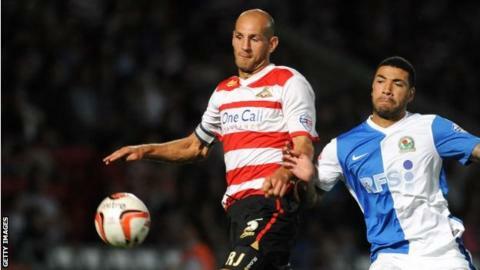 "I'm doing my best for the football club," Jones told BBC Radio Sheffield. "I'm sat in this seat and will stay in it until I'm told otherwise. "I've been put in this privileged position and I'm very grateful for that. I love being in this position and will do everything in my power to stay in it." Jones, who won 10 of 20 games during a spell in charge of Doncaster between January and May 2013, has taken only one point from the club's two matches since Dickov's departure. However, he believes the side, who are 22nd in League One, will soon climb the table. "Everyone at the football club has come together," Jones said. "We're now at a point where the players believe they can do well and believe we can move the club forward. "This is what I want to do and I'm loving it. I went to get my coaching badges, watched games, analysed things and spent time away from my family to be able to do this."